It’s time we changed our species’ name from “Homo sapiens” to something else. “Homo sociâlis”, would be my best Linnaeus guess. We are not the great “wise” or “knowing” animal that we claim to be. We are instead more profoundly social than we realize. Research reported in the Science News article, In-laws transformed early human society, supports this. Naturally, I could quibble with some of their hypotheses, but the basic premise is sound, and besides the research backs up my suspicions! Therefore, I have nothing to add other than to reply later to a comment made by Mr. Guitchounts who specializes in neuroscience. I suppose that accounts for his championing of human cognitive prowess. Give it up for in-laws. Those much-maligned meddlers helped spur an ancient social revolution that propelled human groups from savannas to cities, a new study suggests. 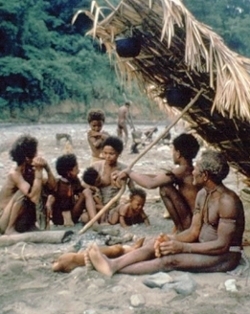 That conclusion stems from an analysis of genealogical and marital data indicating that, among modern hunter-gatherers, monogamous sexual unions between men and women from neighboring groups create networks of in-laws that spawn widespread cooperation and cultural learning, says a team led by anthropologist Kim Hill of Arizona State University in Tempe. Social groups organized in this way distinguish humans from other primates, Hill and his colleagues propose in the March 11 Science. A social system of this type, which encourages collaboration among genetically unrelated individuals, originated approximately two million years ago as human ancestors began to hunt and gather foods that youngsters could not obtain for themselves, Hill hypothesizes. In this situation, females would have had an incentive to seek mates willing to stick around and provide food for offspring. In contrast, female chimps mate with many partners. Males in adjacent chimp groups try to kill each other on sight, making cooperation between communities impossible. “Differences in social structures, not necessarily cognitive advances, allowed our species to cross the barrier to cumulative cultural evolution,” remarks anthropologist Joseph Henrich of the University of British Columbia in Vancouver. In this process, cultural inventions become increasingly complex from one generation to the next. Three social features characterize hunter-gatherer societies and are unique to humans, the researchers conclude. First, both men and women are as likely to stay in the bands they were born into as to move to new bands to find marriage partners. Second, adult brothers and sisters frequently reside together, along with lots of in-laws. Third, a majority of band members are genetically unrelated. In a comment published in the same issue of Science, anthropologist Bernard Chapais of the University of Montreal argues that this monogamy-based social structure encourages males to circulate freely among bands in which they have kin and in-laws. Cultural innovations and traditions thus spread rapidly and unite bands into larger social units called tribes, Chapais proposes. Cultural learning among hunter-gatherers led to the rise of agriculture around 10,000 years ago and the ensuing formation of states and complex institutions, Hill hypothesizes. My response to a comment posted on this research on the Science News website. Grigori Guitchounts says, “This is hardly impressive in terms of importance and scientific credibility.” That sounds like he’s defending human cognitive ability. I guess if you don’t like the research results, it is tempting to downplay the implications. We are not objective when it comes to judging ourselves. Obviously, that is natural. Like all other animals, our perceptions are species-centric. Still, it’s a shame we can’t see that better than we do. If we could, we might be more circumspect in our judgments, and even improve our chances for self-understanding. I’ve long suspected that the principle reason for our dominance on the planet was due to our social instincts much more than our intelligence. Yet, because we are ‘Homo sapiens’ our cognitive prowess skews any self-evaluation we make. The judge is judging the judged — it’s laughable. This article goes a long way to uncovering the deeper reasons why we’ve ended up where we are today. Sure the brain, the thumb, the upright posture all played a role, but not as profound as the social aspect — teamwork is the magic.